I’m a lover of dumplings. Sometimes I keep frozen bags of pre made dumplings in my freezer, because sometimes you just really need a big plate of dumplings. That being said I always feel a little guilty about the quality. 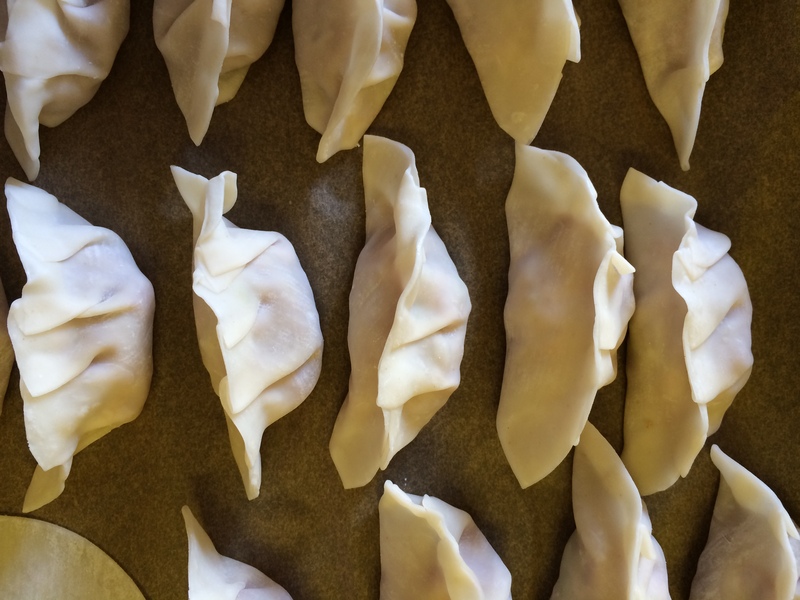 So once in awhile, I’ll make a batch of homemade and freeze the rest for those dumplings moments. I didn’t make the wrappers but the Nijiya market close to my house had organic wrappers I felt good about. I kind of used a recipe sort of. Basically, I finely chopped a small napa cabbage sprinkled some salt on it, and let it sit for about 20 minutes before pressing the water out, I added that to about a pound of ground pork, with a clove of chopped garlic, a few splashes of soy sauce and rice wine vinegar, a pinch of sugar, and a touch of sesame oil. I always microwave a tiny bit of filling for about 20 seconds to taste it for seasoning, I do this with meatballs too, although a few minutes in a fry pan would work as well. This is a basic recipe and would be great with ground turkey for a leaner dumpling, or a mix of both, and you could add in chopped cilantro, chives or water chestnuts. I pan fry these on medium with oil until brown then add a couple of tablespoons of water and cover with a lid and continue to cook for 5-7 minutes, or until you hear the pan is dry, and remove the lid and let them brown a few more minutes if needed. For a dipping sauce I pour roughly equal parts quality soy sauce and rice wine vinegar into a small bowl and add a couple of drops of sesame oil, or if you like it hot, chile oil. They’re also great with the dipping sauce and chopped scallions and toasted sesame seeds. To freeze place them not touching on a baking sheet and place in the freezer, no need to cover, for 20 minutes, once they are frozen on the outside you can put them in a bag or airtight container and keep them for months in the freezer. No need to thaw them when cooking, just add a little more water and steam for a few extra minutes. 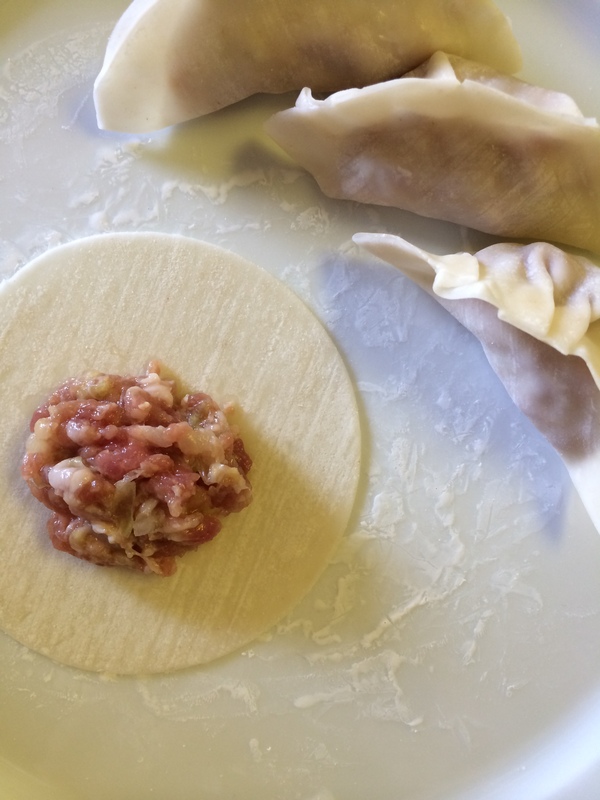 At about 2:30 a simple how to on dumpling folding. 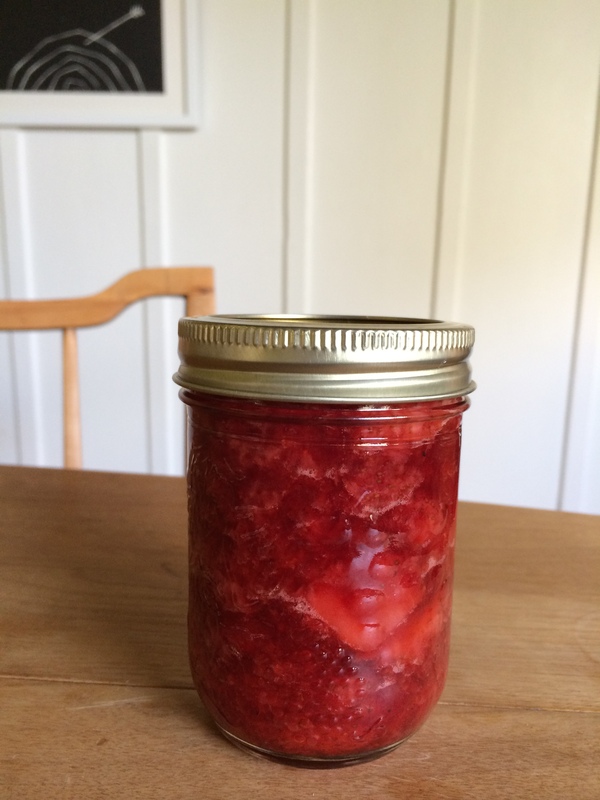 I had a pint of aging strawberries, but I always imagined making jam would require a full day, and there would be no point in making less than 12 jars or so. This quick recipe took me about 1 hour, and likely isn’t shelf stable, however with just 1 jar I plan to keep it in the fridge and use it right away. I made it with no pectin and it is much lower in sugar than most traditional recipes. This recipe seems pretty close. I’d really like to do more preserving in the future, but definitely find it a little daunting, even though it seems pretty simple. 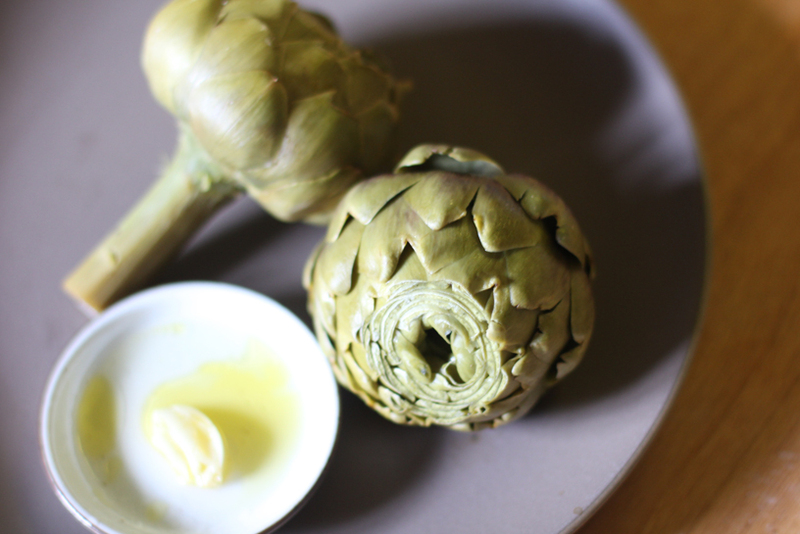 Artichokes are gorgeous right now. 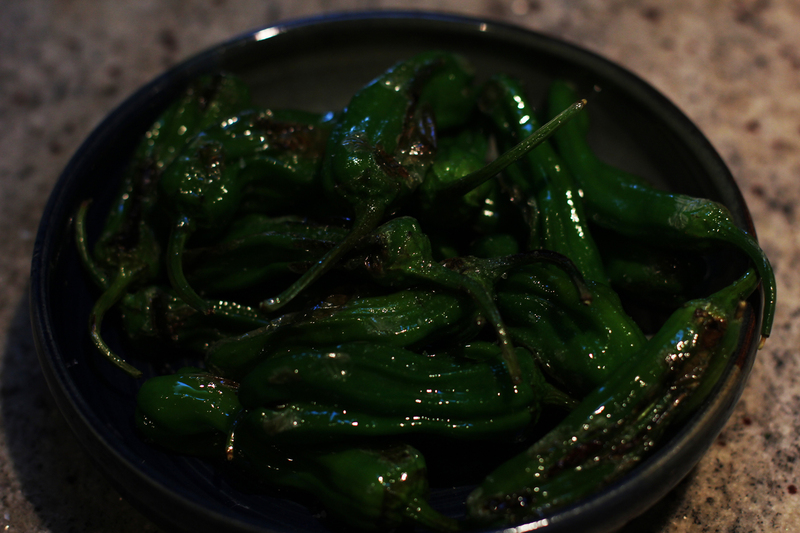 I steamed these for about 25 minutes, and ate them with olive oil, fresh squeezed lemon juice, a crushed clove of garlic and sea salt. Super clear step-by-step prep guide. I had two good friends staying with us this weekend and I always like to have a little something to eat for visitors after the fatigue of travel. 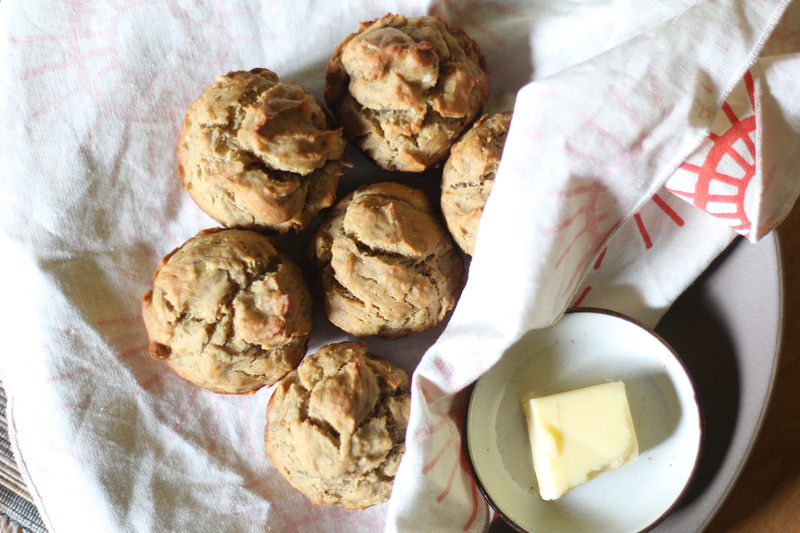 Two overripe bananas were not enough for my usual banana bread recipe, so I halved it and used a muffin tin instead. I may just stick to the muffin format going forward as you don’t end up with the slightly drier end pieces. 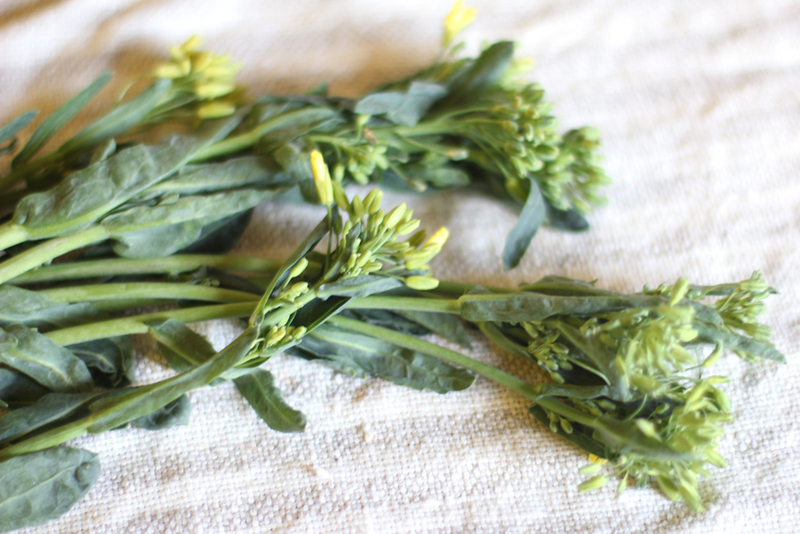 These little kale greens with flowers caught my eye last time I was at Bi-Rite Market. I try to make a habit of picking up unfamiliar greens and things on a pretty regular basis. Marketed as broccoli of lacinato kale, I was certainly intrigued. They’re the final stage of the kale plants life, when it shoots up flowers. Often the bolting (flowering) of a green like lettuce or chard leaves the plant quite bitter. 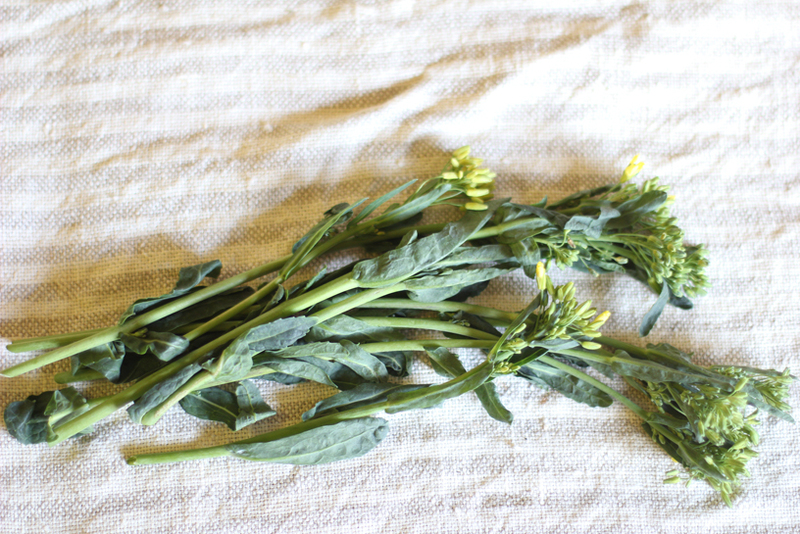 In the case of kale the flowers seem to resemble more closely broccoli raab, sweeter, mild and kaley. I sautéd them quickly with a drizzle of oil, garlic and a touch of fish sauce. 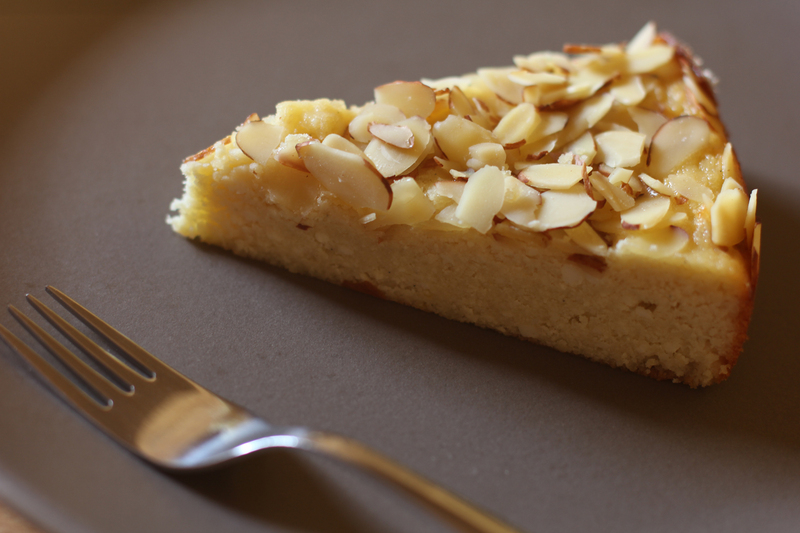 Lemon ricotta almond cake that just happens to be gluten free. I saw the recipe on Apartment 34 who spied it on Cakelets and Doilies, and had to make it asap. 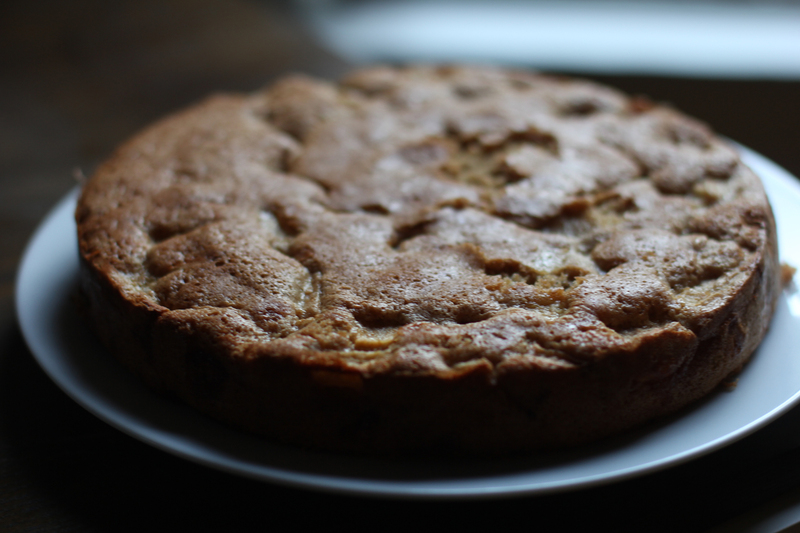 It’s super simple, moist and somehow both light and dense. I skipped the icing sugar as I found it to be sweet enough without. It keeps well the next day, and yes I definitely ate it for breakfast, and for midday snack, and then some more. This is one of those cakes you can throw together in 20 minutes including clean up, and the remaining hour is just baking time. It’s pretty virtuous, as in the kind of cake I wouldn’t feel guilty at all about eating for breakfast. Just apples, eggs, flour, sugar, vanilla, salt, and butter for the pan, all of which I usually have in my house at any given time. I follow Deb from Smitten Kitchen’s recipe almost exactly, except I use spelt flour to health it up even a little more, a pinch of salt in the batter, and I usually use just shy of the 1 cup of sugar and find it sweet enough. Newest addition to my list of ridiculously simple, beautifully subtle and delicious foods. A mild flavoured pepper, with a delicate skin, and the lovely risk of roughly one in ten being spicy. They taste of summer, and I ate nearly the entire bowl and wished I had more. Sadly none of mine were spicy so I can’t advise on what to expect spice wise. Rinse fresh crisp shisito peppers, pat dry, poke each pepper with a knife to form a tiny hole to allow any steam to escape while cooking. Heat pan with a heat safe mild flavoured oil like grapeseed until shimmering, and just before smoking. Add the shishito peppers, and toss frequently until the outsides are blistered and the peppers have just started to soften. Slide into a bowl and finish with course sea salt to taste. Eat them as finger food, leaving just the stem. I fell in love with chilaquiles from here. 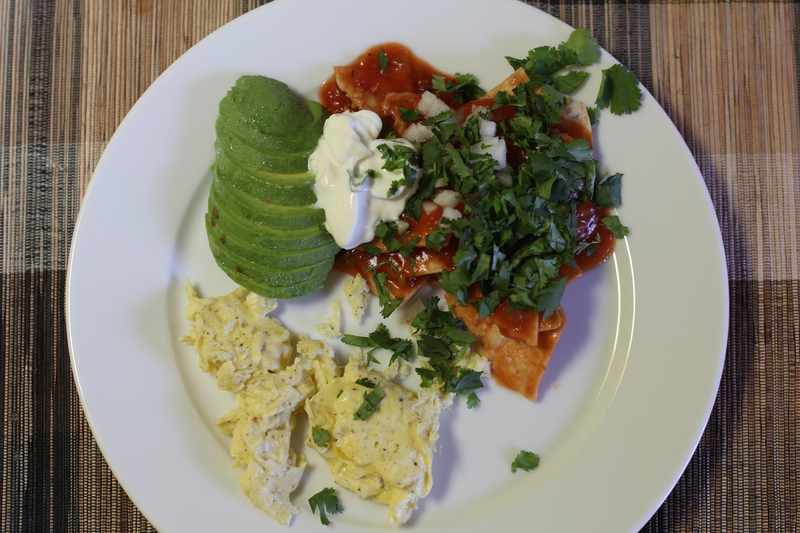 I’m sure my take isn’t particularly authentic, as this is the kind of dish that loving Mexican grandmothers make. However, it is the perfect thing to use up leftover salsa and tortilla chips. Heat salsa in a pan with a touch of water, prepare chopped onion, cilantro, slice half an avocado and sprinkle it with salt, scramble an egg, and toss the tortilla chips briefly in the warmed salsa. Top with a touch of crema or in my case greek yogurt, and queso fresco if you have it. This is one of those dishes that feels incredibly decadent, but in reality isn’t much worse than eating a handful of chips and salsa. It could be made pretty easily for a group, and is open to whatever your preference. Just make sure you are using nice thick tortilla chips, or preparing your own by frying old corn tortillas. I celebrated valentine’s day by making a cheesecake. My very first. Yes it cracked, and the only pic I took was before it was served, but I made it! I think I let it cool too quickly, because that beauty was pristine when it came out of the oven. I love smitten kitchen. 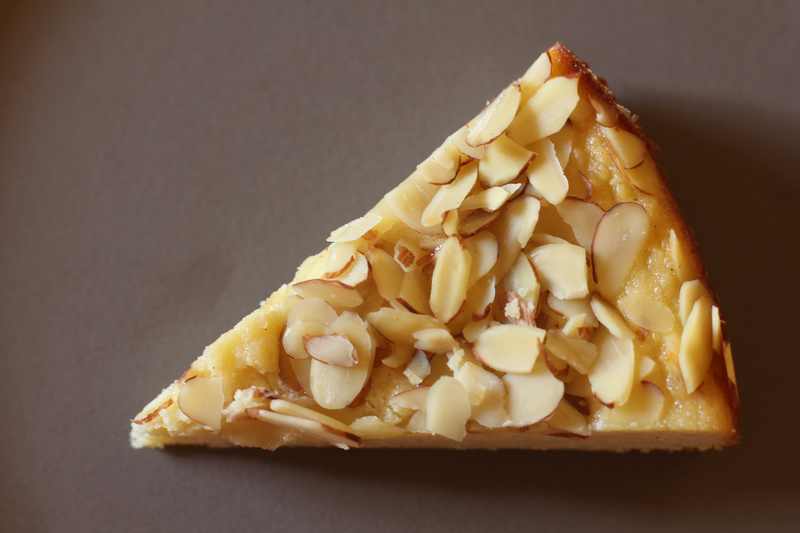 Deb’s blog is a constant source of food inspiration. I wanted to make a key lime cheesecake, and of course she had a recipe. 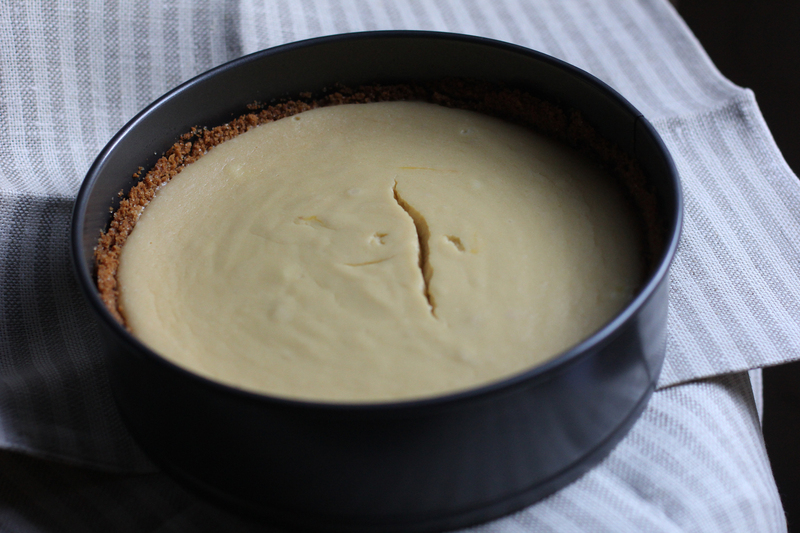 I used the crust from her New York cheesecake recipe because it seemed to make a bit more. I finished this guy with a slap of whipped cream and some lime zest. All I can say is a cheesecake is a lot less intimidating then I thought it would be.